The hotel is classified as 3 stars hotel ideally located at Sousse, and situated in a pleasant gardens at the edge of a magnificient sandy beach between the center of Sousse and Port el Kantaoui. 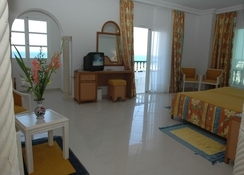 The hotel is entirely air-conditioned and offers 213 rooms and 10 suites with sea and pool views. Hotel offers a wide range of services which appeals for both families, couples and also individuals. this hotel offers you the rest and relaxation you need on your holiday. you enjoy all your time with a various and rich animation programms and with exotic moments on the beach and swimming pool. Hotel offers a main restaurant serving a delicious dishes including a various specialities from local to international gastronomy besides a pizzeria. 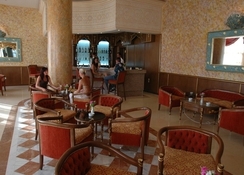 A wide range of alcoholic and non alcoholic drinks are served in bars and in cafe. At your disposal many other services including sauna, hammam, balneotherapy, fitness, shop, a swimming pools for Adults and for kids, a tennis courts, car hire, excursions. A professional animation team offering a rich animated programm, mini golf, horse ridings. The hotel is ideally situated at the edge of magnificient sandy beach between the center of Sousse and Port el Kantaoui. The hotel is located at the heart of a magnificient gardens near by the superb golf course of Port el Kantaoui. The Habib-Bourguiba internationalb airport is away about 15km from the establishement. The hotel counts in total 213 rooms and 10 suites, sufficiently spacious and have a differents amenities to make your stay as comfortable as possible. Rooms are air-conditioned or heated(depends on season), having a telephone, satellite tv, bathroom, and they offer a sea, garden or swimming pool views, with also a balcony. The nearest airport to hotel is the international one of Habib Bourguiba at Monastir which is away about 15 km from the establishement with an approximate driving time of 30mn. A shuttle bus transfers will be arranged to and from hotel besides a special taxis which can do direct transfers.